When deciding where to add your personality into a room, consider what sort of focal point you want to create, say kitchen designers Jennifer Boznos and Sheryl Wardlow, of Insignia by Inspired Design, in Barrington. When designing this space, they considered touches like countertops and cabinet hardware. When you walk into a well-designed room, you probably notice certain elements that tie the room together. Those “finishing touches” can be something small, like the bouquet of flowers on the kitchen island that match the hand towels next to the sink, or something a bit bigger, like the furniture, flooring, cabinets, countertops and other home decor items that all seem to add color and purpose to the room. The right finishing touches for your home should reflect upon your distinct character, says Jennifer Boznos, co-owner with Ethan Axelson of Insignia by Inspired Design, in Barrington. Everyone has a preference for the focal point of a kitchen, she says. For some, it’s the counter. For others, it’s the backsplash. “If my mom could throw Swarovski crystals on everything, she would,” Boznos says. “When we were designing her kitchen, we kept that in mind and found a unique piece of tile from an Italian manufacturer that had embedded 1-inch Swarovski crystals. Then, we found hardware with Swarovski crystals. And we had granite that had mica in there that created a little bit of sparkle. It was well done; not too much bling in your face, but just enough to really make it her own, make it feel like her kitchen. One of the easiest ways to add your own personality to a space is to upgrade your hardware, says Sheryl Wardlow, senior designer at Insignia. 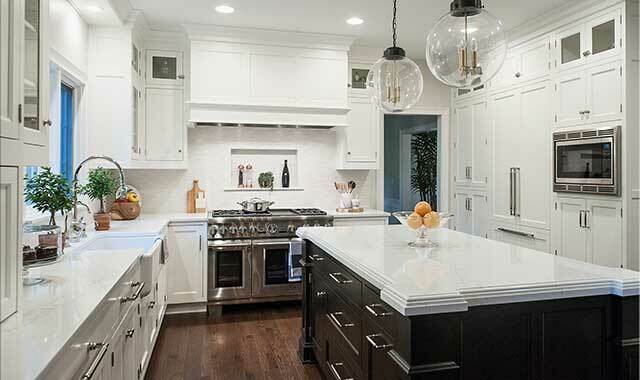 Knobs and pulls are an inexpensive way to modernize a kitchen and give it an entirely different feel, she adds. Another “wow factor” can be a unique lighting fixture. Accent lighting or ambient lighting can be placed strategically so there aren’t any dark corners, says Kathy Fincham, manager of the furniture department at Mayfair Furniture and Carpet in Crystal Lake. If you happen to have neutral taste, that’s OK. Your finishing touch doesn’t have to be anything big, expensive or gaudy. A little bit of greenery can go a long way, and it brings the outdoors in, Fincham adds. These simple elements can have a powerful effect in a room. In fact, sometimes less is more. A single, well-placed piece of furniture may be all it takes to make a room pop, says Bob Wozniak, of Strode’s Furniture, in Huntley. 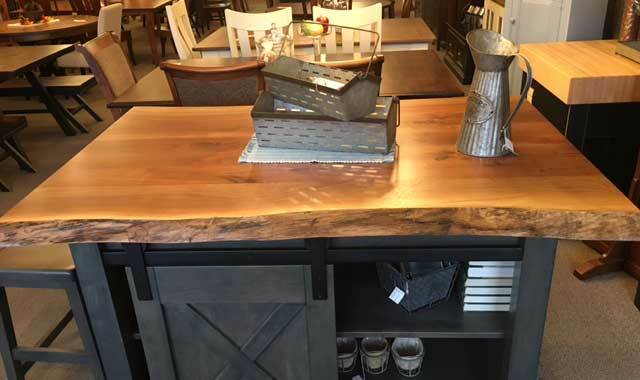 Recent examples at the store include a kitchen island with living edge walnut top, sideboards and accents. A statement piece might be the only finishing touch a room really needs – if it’s the right piece, says Bob Wozniak, owner of Strode’s Furniture in Huntley. Two-toned wood pieces are popular right now. A 4-foot-by-5-foot coffee table with a country white base and almond stain on the top is a great example of how paint and stain can come together on one piece to create a focal point. Wozniak recently showcased a kitchen island featuring a gray stain base and a top made of solid walnut with live edge. “It’s really beautiful,” he says. Mike Owney, of Grace Farm Studios in Woodstock, uses locally harvested hardwoods to create one-of-a-kind, rustic furniture pieces. He recently completed a 10-foot-long table for a client whose home was situated near a lake, says his wife, Ann Chaney. That particular piece wasn’t terribly complicated, but it was large, she says. The way Owney arranged the grain in the oak wood and highlighted the grain by making bow ties in opposite directions was a real finesse job. Sometimes a group of furniture pieces can make a statement together – and it doesn’t necessarily have to be a matching set. Even changing the species of wood from room to room – or within a room – can create contrast and interest. If you’re pleased with your existing furniture but still want to give new life to a room, one new accessory or small piece of furniture may be all you need. A decorative bench in the hallway, for instance, can provide storage and a spot to add an ornamental piece, Wozniak says. Similarly, a TV console with space for a DVD player, cable box and sound bar can finish off a family room. “A lot of times, even putting a sofa table behind a sofa or love seat gives you a place to put family pictures or extra lighting, or even a flower arrangement,” Wozniak says. In your dining room, accessories could be key to pulling the room together. A table topper can dress up any table, and a small accessory – a mug tree, a multi-tiered cake plate, a flower arrangement – can give it one more pop of life. “Do you go to a party and not wear your diamonds? The accessories make the outfit; accessorizing makes the room,” Wozniak says. As you work with accessories, try to coordinate the colors around the room so everything flows, says Fincham. “Once your furniture is in place, the finishing touches will be spreading the color around the room and different textures around the room, like metal elements or artwork,” she says. There are a few rules of thumb to keep in mind. First, use an accent color in three places “so your eye looks around the room,” Fincham says. Your choice accent color could come from the pillows you place on your main sofa, which could then be replicated in the drapes and rugs, Fincham says. “You don’t have to have the same accent color in every room, but you can use a secondary color in another room to make it flow,” she adds. Mike Owney and Ann Chaney, owners of Grace Farm Studios, in Woodstock, create handcrafted wooden furniture and decorative fiber accents – such as wallhangings and pillows – that infuse a client’s personality into the room. What’s under your feet can make a big statement. Hard surfaces are popular right now, especially engineered hardwood and luxury vinyl tile (LVT) or luxury vinyl plank (LVP), says Amy Finn, flooring sales consultant for Mayfair. Those surfaces alone can be considered a finishing touch. But there are additional ways to provide a little extra something. Ann Chaney, a fiber artist at Grace Farm Studios, agrees. “Rugs in various sizes do add something to a room, and the type of rugs that I do are made from Icelandic wool, with a lot of variety of colors,” she says. Her freeform crocheted rugs use locks of Icelandic fleece joined together in random patterns. Stair runners are regaining popularity, Finn says. They can add interest to a room with a pattern or provide stability with a solid color if a room already has patterned drapes or furniture. You can think outside the box and use flooring in different ways. A feature wall, for example, can be created by arranging vinyl tile in a shiplap style that mimics a farmhouse look. Sometimes a finishing touch is a piece you simply can’t find anywhere else. 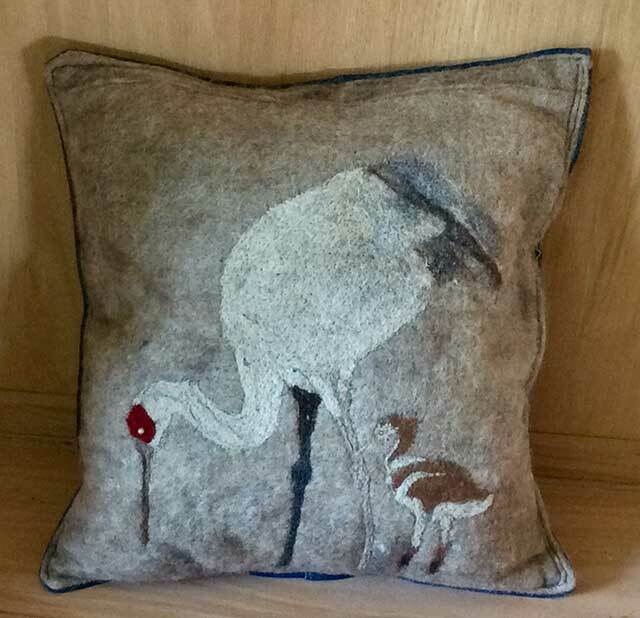 Often, Chaney is asked to create Icelandic wool fiber art rugs, pillows, wall hangings and home decor baskets with a particular theme to match a homeowner’s personality and style. Chaney has made tapestries to hang on barren walls and bring a room to life with size, texture and subject matter – often wildlife such as sandhill cranes, barn owls, red-winged black birds or a rearing stallion. Some tapestries have been as large as 4 feet by 5 feet, though not in a conventional rectangle – which is exactly what makes them interesting and personal. As with Chaney’s fiber art, the handcrafted furniture and art pieces created by her husband, Mike Owney, can’t be found anywhere else because they’re made specifically for – and in collaboration with – each client. Ultimately, that’s what a finishing touch is – something that reflects on your personality, says Boznos. This entry was posted on Wednesday, November 21st, 2018 at 11:59 am	and is filed under Home & Garden. You can follow any responses to this entry through the RSS 2.0 feed. Both comments and pings are currently closed.